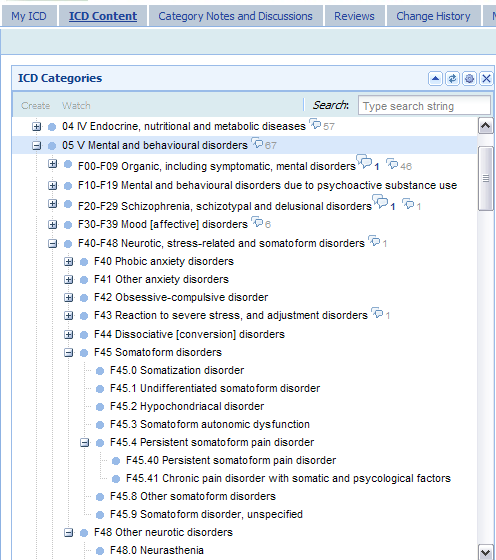 On 16 January, I reported on my Dx RevisionWatch site that the page for current DSM-5 proposals for the revision of the DSM-IV categories and diagnostic criteria for “Somatoform Disorders” had been updated on 14 January, with a new category proposal called “Simple Somatic Symptom Disorder”. 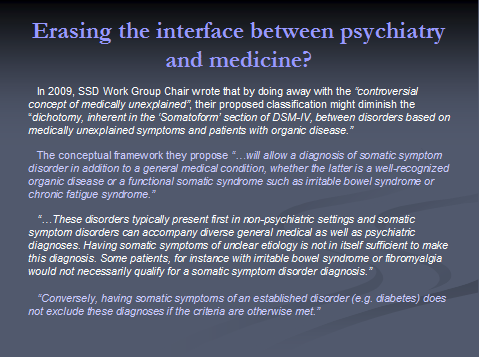 This proposal is in addition to the recommendations of the Somatic Symptom Disorders Work Group, published in February 2010, for grouping a number of existing Somatoform categories under a common rubric “Complex Somatic Symptom Disorder (CSSD)” and does not replace “CSSD”. The Justification of Criteria document has now been revised by the SSD Work Group to incorporate the new proposal for SSSD and some further revisions, and is replaced by a document designated DRAFT 1/31/11. 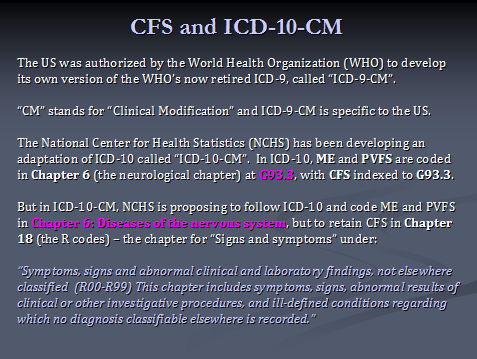 I shall be monitoring the DSM-5 Development website and if there are any further revisions to either document before the DSM-5 beta is published I will update this site. According to the APA’s DSM-5 Development Timeline, beta draft proposals are scheduled to be published by the DSM-5 Task Force in May-June, with a public review period of only around a month. The public review and comment period for the first draft, last year, had been around ten weeks. Yesterday, I posted a House of Lords Written Question that has been tabled by the Countess of Mar, on 21 October, in which questions are raised about the ethical approval of the Dr Esther Crawley led Lightning Process pilot study in children. A Written Answer is expected on 4 November and I shall publish that answer here. There have also been some developments with the National Research Ethics Service (NRES) which I am not involved in, myself, but I will report on those developments as more information becomes available. 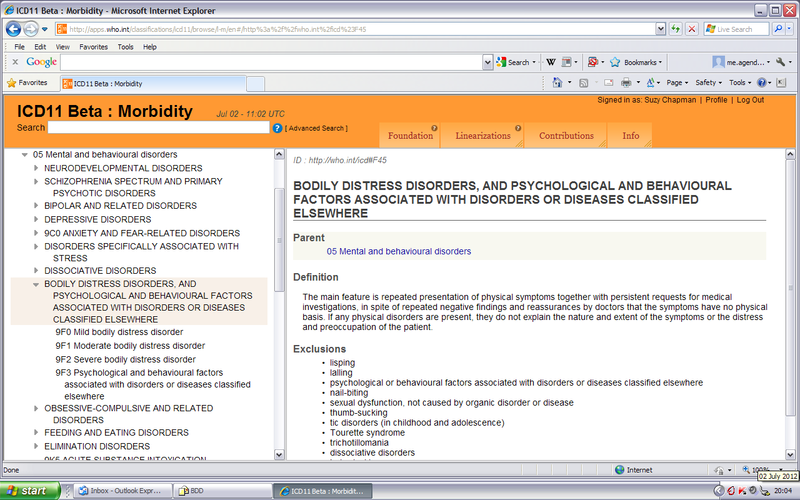 I maintain several WordPress sites and I shall continue to post alerts on this site to new material published on my Dx Revision Watch site – the concept for which developed out of research and awareness raising undertaken throughout 2009 around the forthcoming revisions of two important international disease classification systems: the (APA) American Psychiatric Association Diagnostic and Statistical Manual (DSM) and the World Health Organization International Statistical Classification of Diseases and Related Health Problems (ICD). Other than that, I do not intend to post further material on ME agenda site. I don’t like the nonsense that passes for rational discourse so often in our society. I am very much bothered by the inaccuracies, ambiguities, code words, slogans, catch phrases, public relation devices, sweeping generalizations, and stereotypes, which are used (consciously or otherwise) to influence people. I am bothered by the inability of many to recognize these for what they are. I am bothered by the way people fudge issues, or are unable to clarify them, sometimes because they are inhibited by “collegiality” and other forms of intimidation (sometimes subtle, sometimes not). Most people put up with the nonsense without doing anything about it (unable or unwilling, for whatever reason – inertia, lack, of energy, lack of interest, lack of time, etc. ), often falling into cynicism and despair. I am bothered by the misinformation which gets disseminated uncritically through the media and by the obstructions which prevent correct information from being disseminated. These obstructions come about in many ways – personal, institutional, through self-imposed inhibitions, through external inhibitions, through outright dishonesty, through incompetence – the list is a long one.